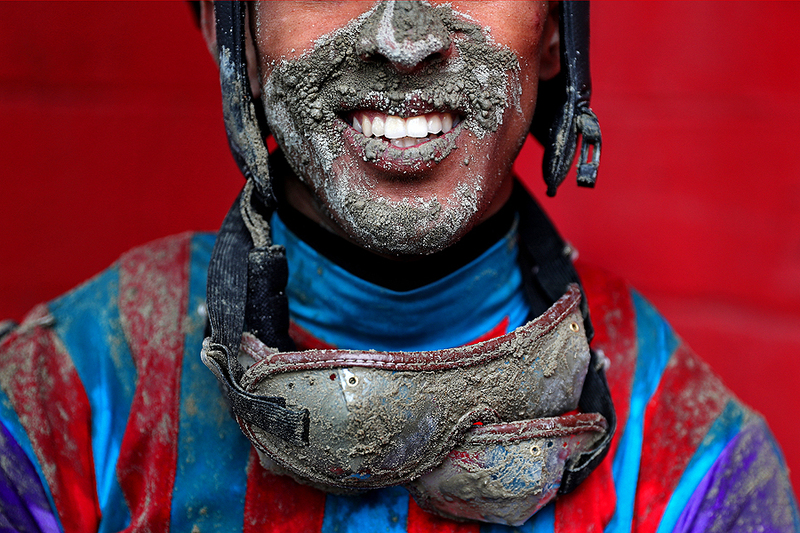 "Jockey Victor Carrasco poses for a portrait after jockeying Never Stop Looking in The 2nd Running of the Old Bay Race prior to the 141st running of the Preakness Stakes at Pimlico Race Course on May 21, 2016 in Baltimore, Maryland." There is nothing more challenging then covering the same event year after year. I've covered the Preakness Stakes at Pimlico Race Course for six years in a row - and that doesn't count what I've documented not in succession. Obviously, each year variables change. The weather may be good or bad. There may be a policy changes for fans. A horse could scratch from the race. And so much more. But for the most part, the venue and purpose of the assignment are relativity unchanged. So trying to capture the week long of morning workouts and then the one day event in a new light is always fun, but a huge challenge. This year, lots of rain already changed our game plan at Getty Images. That in turn changed how I approached and documented the week. Not only did we walk away Saturday night with brilliant coverage as a team, I thought I had one of my best Preakness weeks to date, and that goes back to my teammates doing the same.